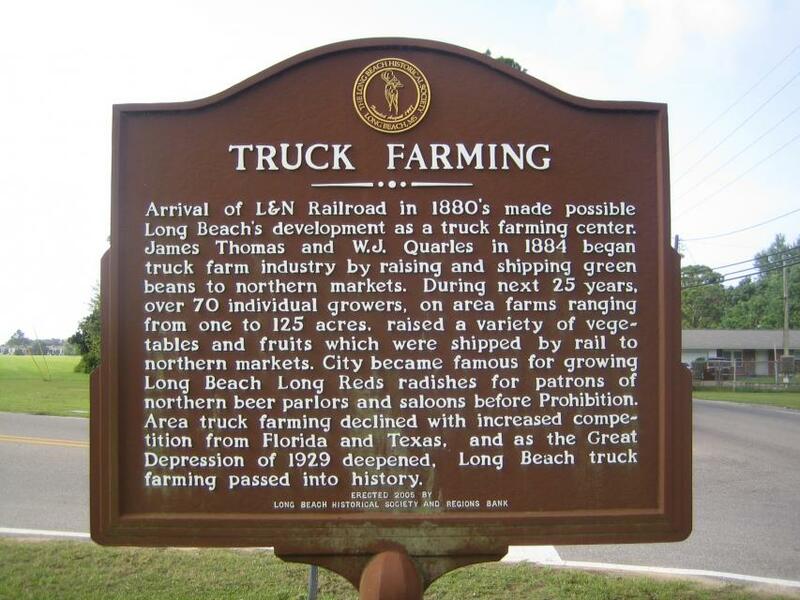 Arrival of L&N Railroad in 1880's made possible Long Beach's development as a truck farming center. James Thomas and W. J. Quarles in 1884 began truck farm industry by raising and shipping green beans to northern markets. During next 25 years, over 70 individual growers, on area farms ranging from one to 125 acres, raised a variety of vegetables and fruits which were shipped by rail to northern markets. City became famous for growing Long Beach Long Reds radishes for patrons of northern beer parlors and saloons before Prohibition. Area truck farming declined with increased competition from Florida and Texas, and as the Great Depression of 1929 deepened, Long Beach truck farming passed into history. This marker can also be identified by its HM code. You can use the hashtag #HM1JAY in tweets, and any other place where you might refer to this marker, including when searching on this site.